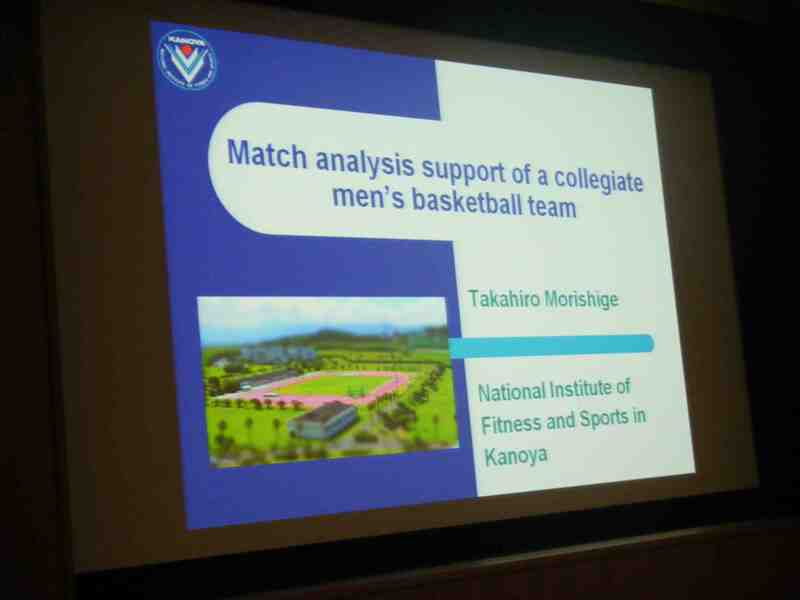 Takahiro Morishige’s paper on match analysis support of a collegiate men’s basketball team was presented by Hiroo Takahashi. (Hiroo is Takahiro’s Masters’ supervisor.) 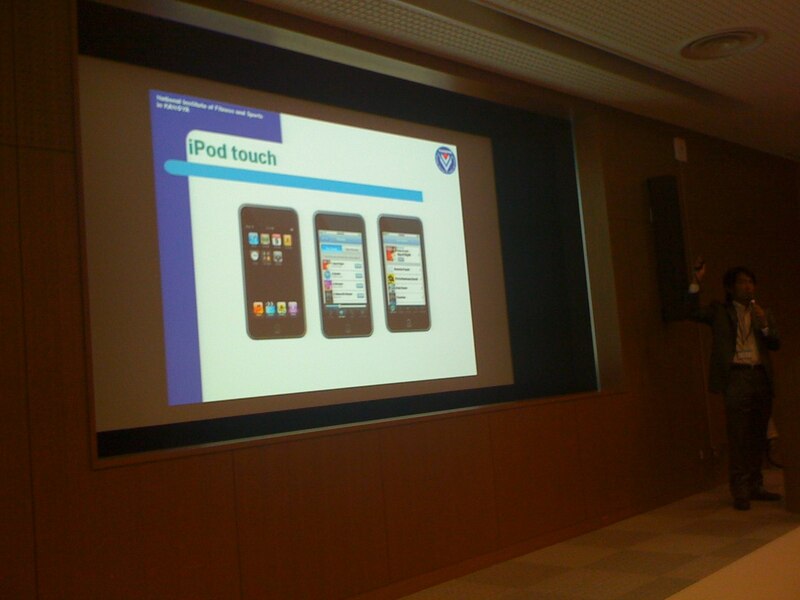 The paper described the combination of analysis software and iPod Touch to support coach and athlete development. 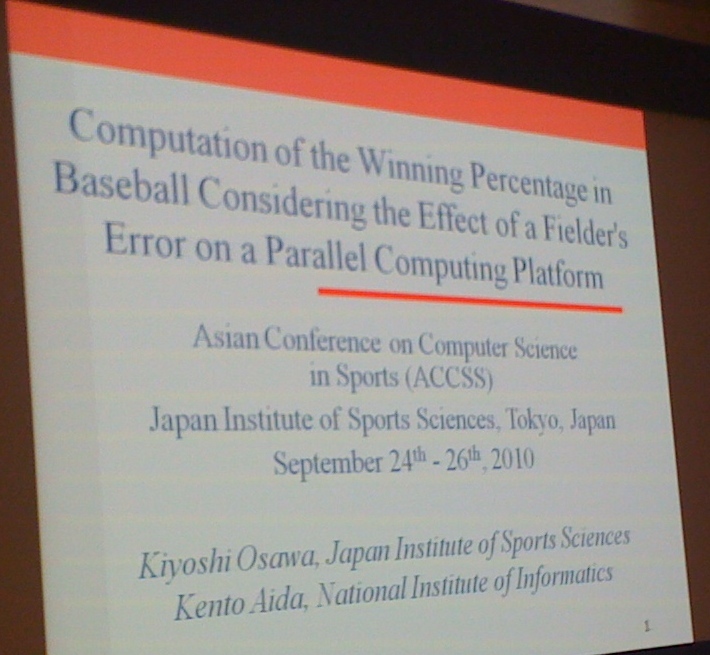 Kiyoshi Osawa explored the computation of the winning percentage in baseball with reference to the effect of fielder error. I liked Kiyoshi’s use of animation to locate his paper within the game of baseball. I was very interested in his account of computational complexity. 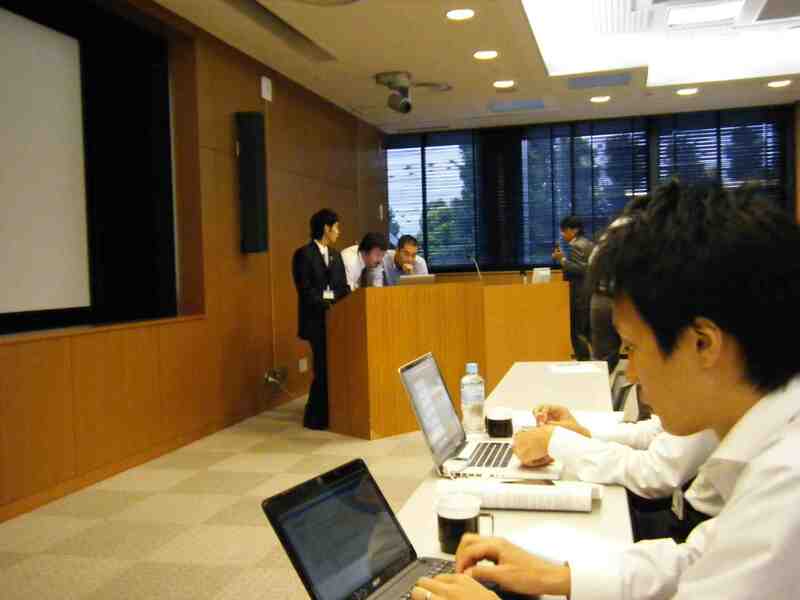 The analysis of the data was enabled by Aida Laboratory at the National Institute of Informatics. 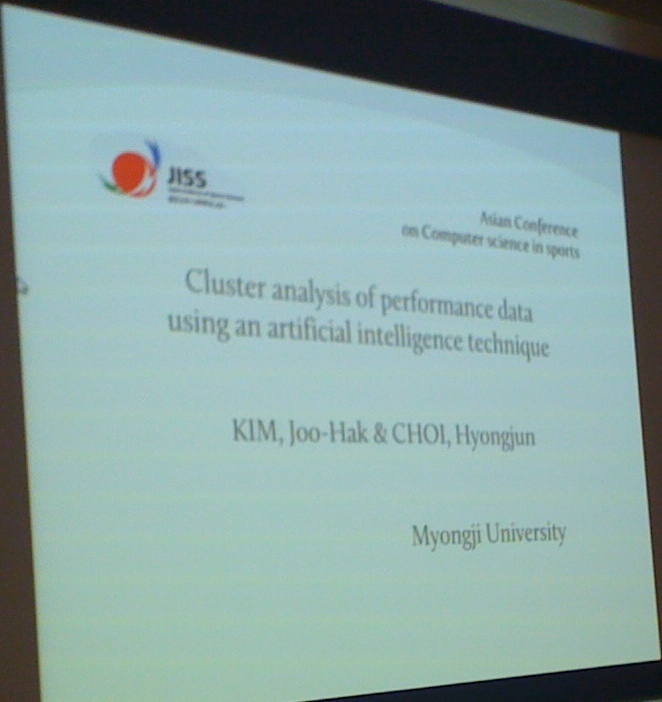 Hyongjun Choi presented his second paper at the conference. This paper presented a cluster analysis of performance data using an artificial intelligence technique. 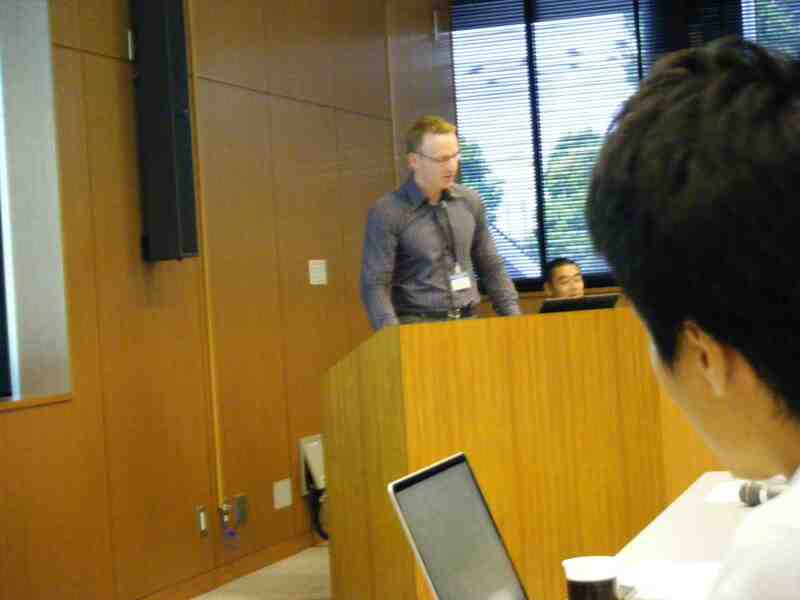 He discussed his use of Kohonen self-organising maps. 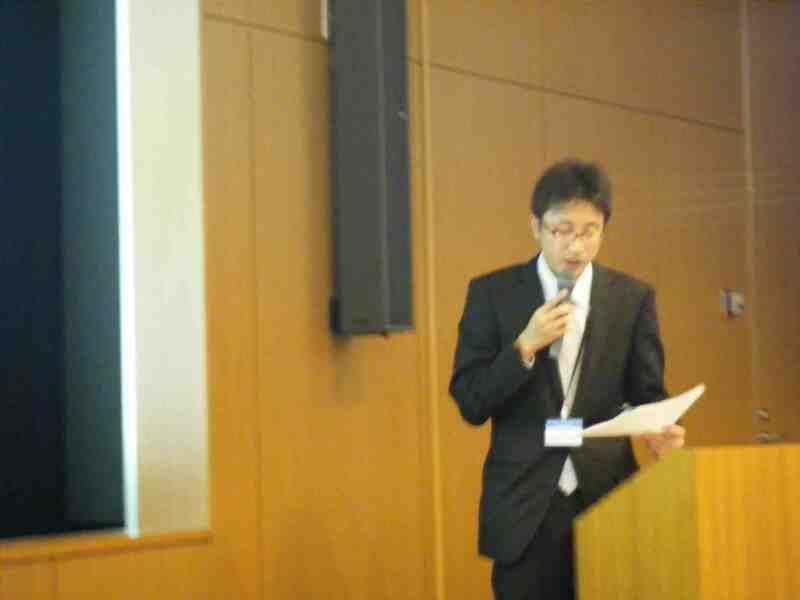 The final paper of this session was presented by Nobuyoshi Hirotsu, the chair of this session. 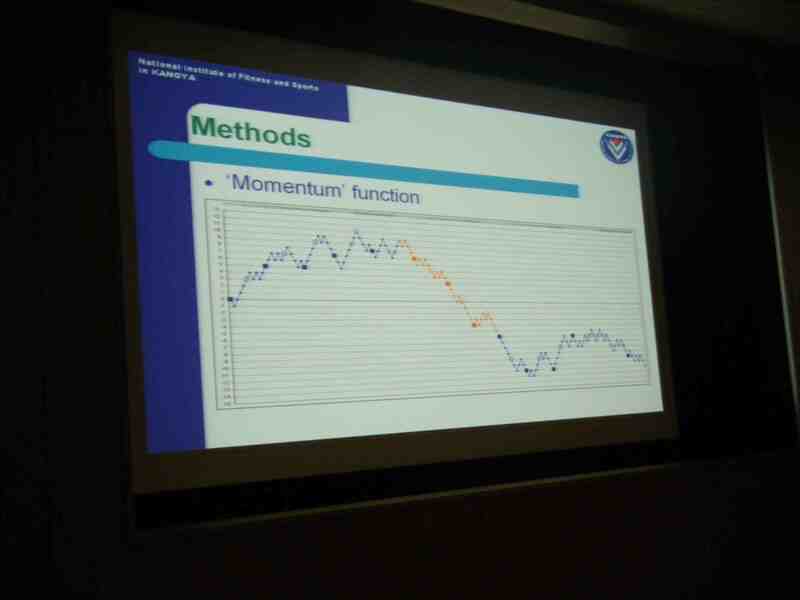 Noboyoshi discussed the relationship between data envelopment analysis and sabermetrics in the evaluation of batters in baseball. 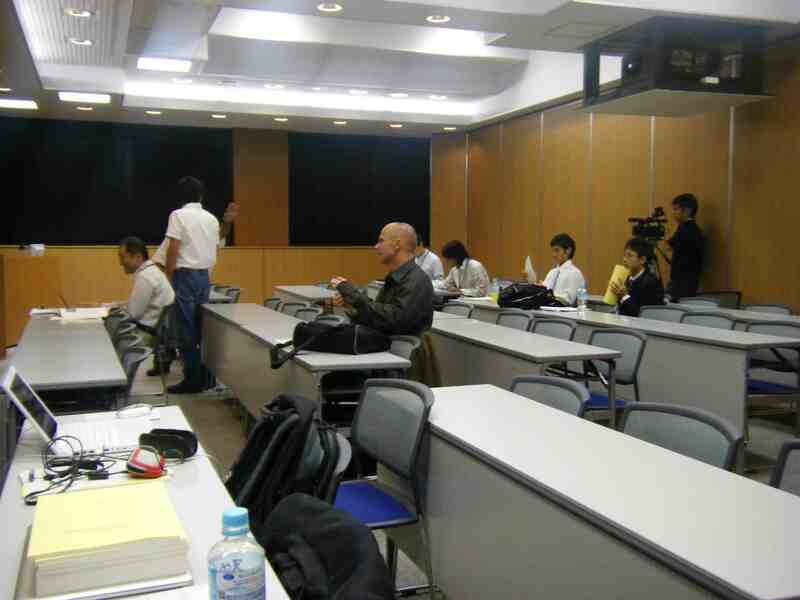 The third session of the conference concluded with a keynote demonstration presentation by Hiroshi Inukai on computer games and sports. 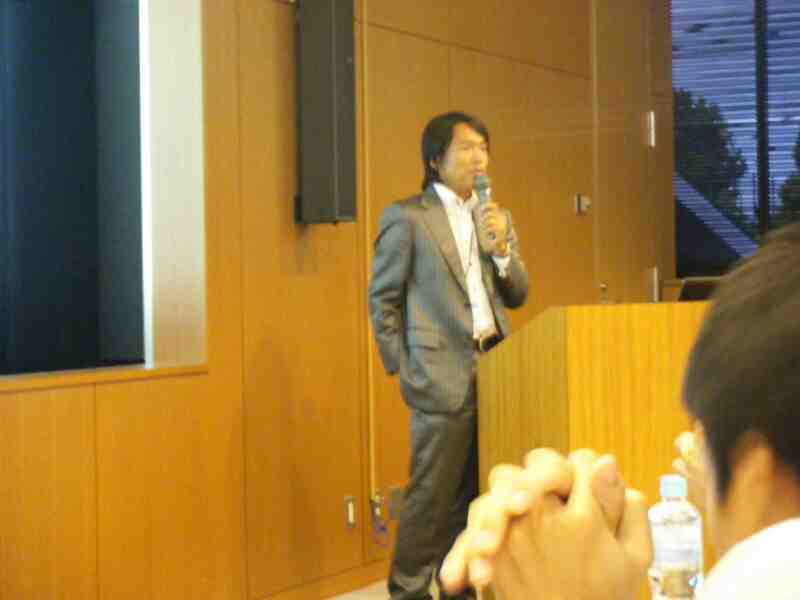 Hiroshi provided an overview of the history of computer games in sports and explored the current status of gaming . He noted the opportunities for the programmable physics potential for eSports. He concluded with a discussion of the challenges facing eSport software. The second session of the ACCSS Conference started at 4.30 pm. 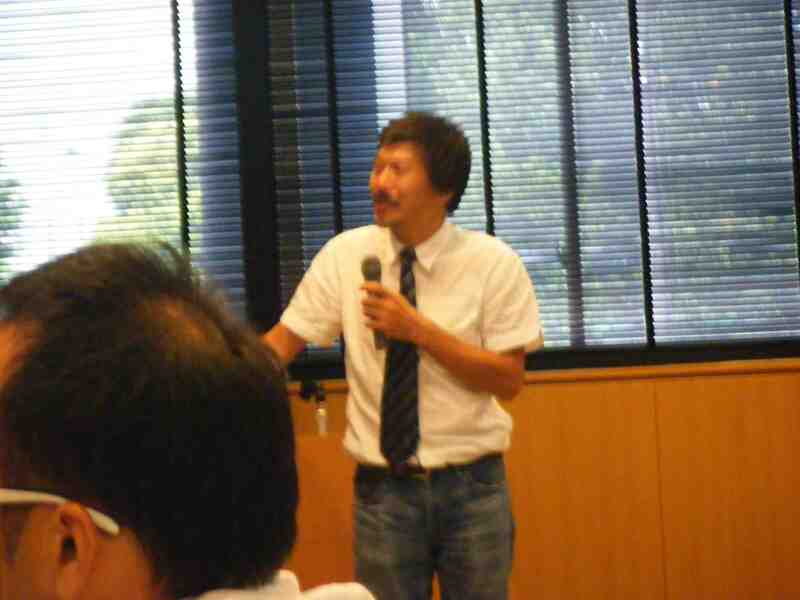 Hiroo Takahashi chaired this session. 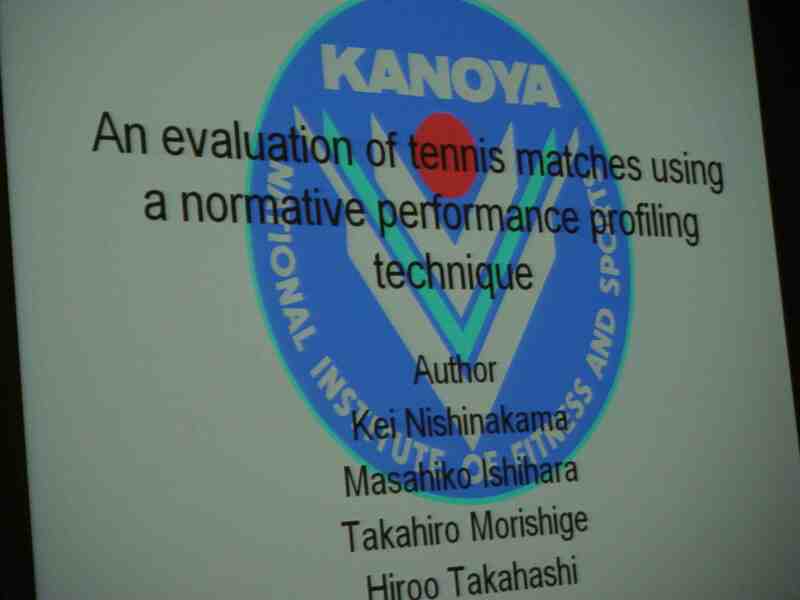 Two of the four papers were students (Kei and Masahiko) working with Hiroo. He inducted these student gently into public presentation. 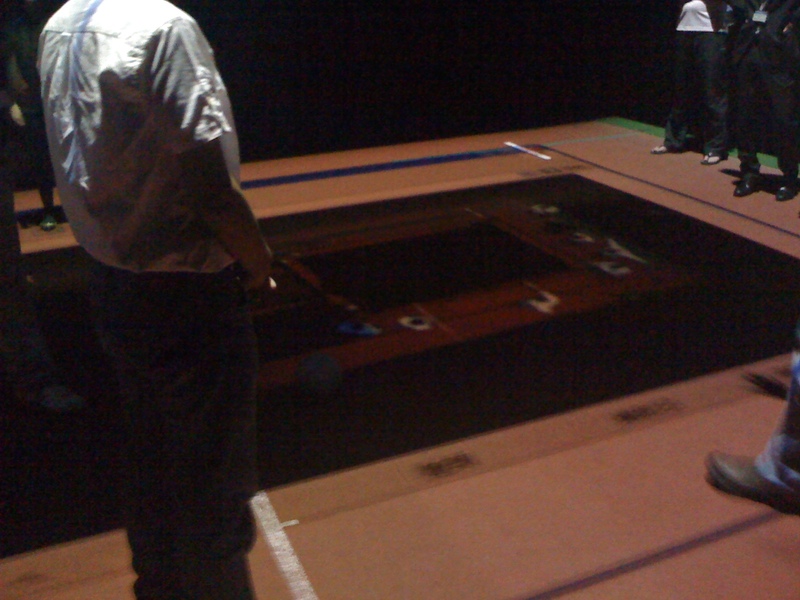 Kei explored the use of a normative performance profiling technique. 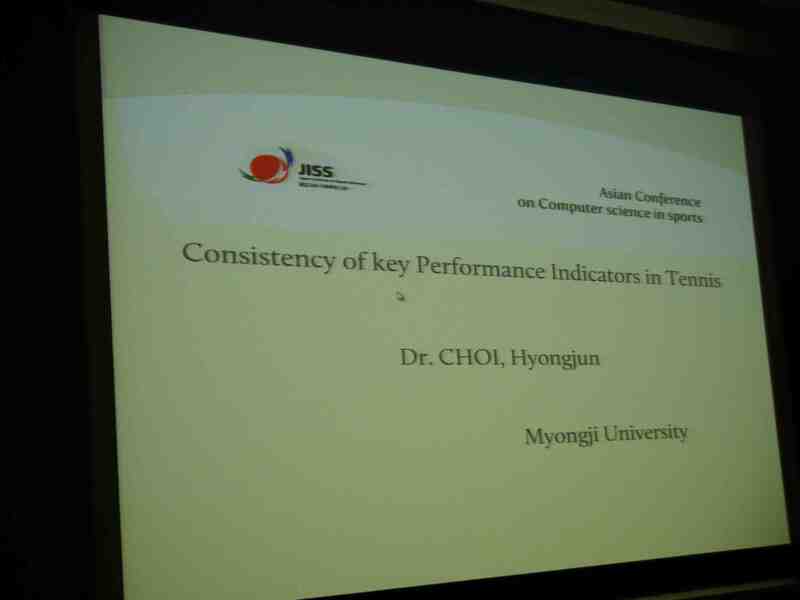 Hyongjun looked at the consistency of key performance indicators in tennis. 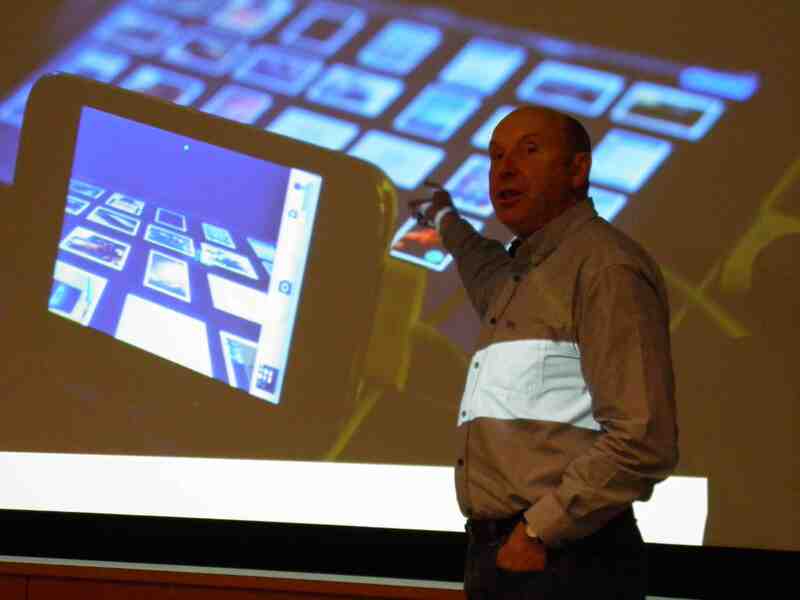 He made a very interesting distinction between real-time and lapsed-time analysis. He explored an absolute distinction between winning and losing and a relative distinction between winning and losing performance. 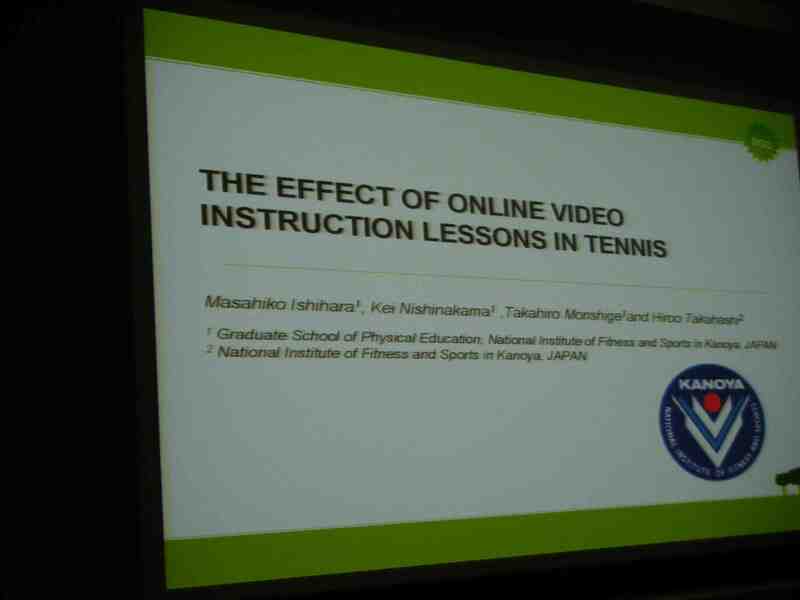 Masahiko discussed the effects of online discussion of tennis technique. 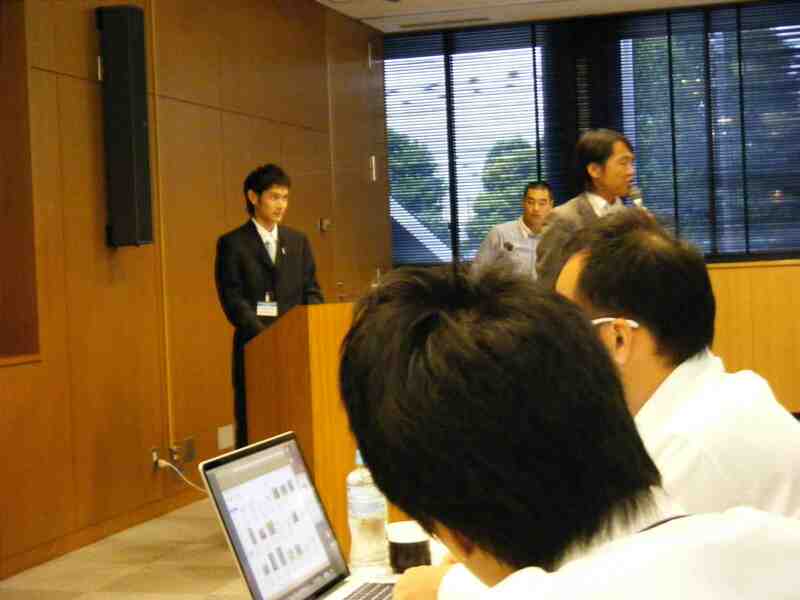 Hiroo presented the final paper of the session and day. 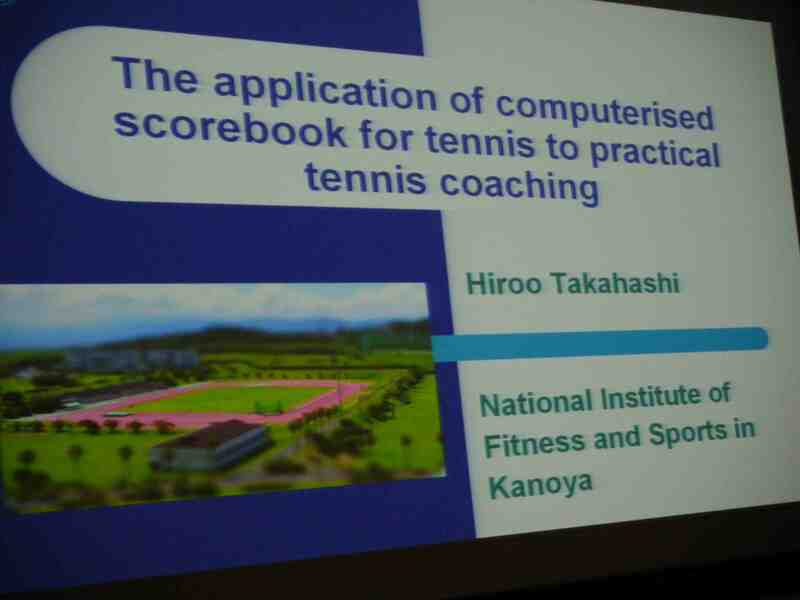 He looked at the application of a computerised scorebook for tennis to coaching. I was very interested in Hiroo’s discussion of momentum and the potential of real-time analysis evident in his scorebook approach.. 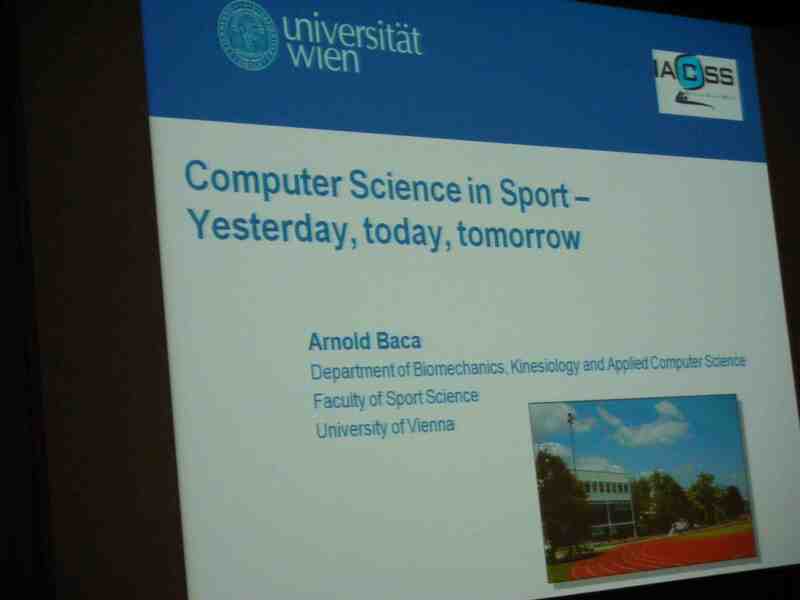 The first keynote was presented by Arnold Baca. Arnold reviewed the history of the development of the IACSS: seven conferences have been held since 1997 (Cologne, Vienna, Cardiff, Barcelona, Hvar, Calgary, Canberra). The host for 2011 will be Shanghai, and in 2013, Anadolu. IACSS was founded formally in 2003. Arnold noted that there are six national computer science in sport associations (Germany, Austria, Croatia, India, Turkey, China). 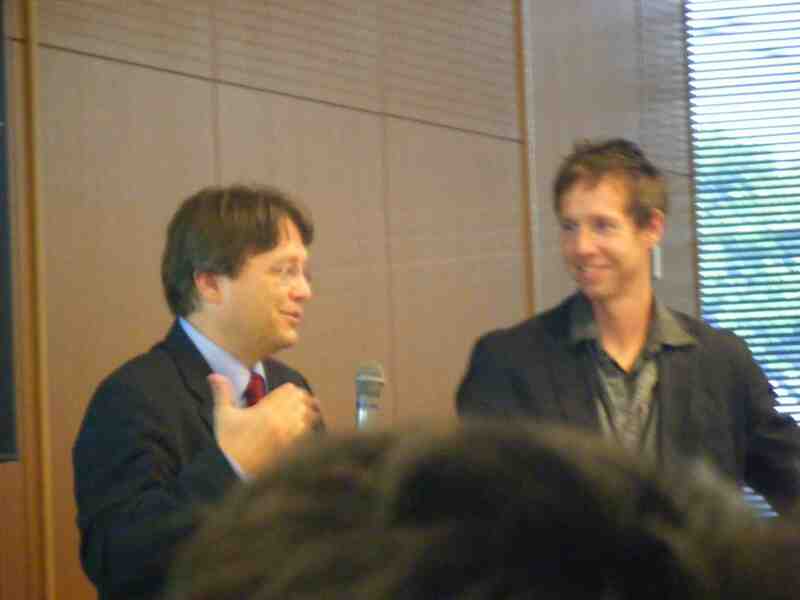 Arnold noted that there is a Wikipedia article about computer science in sport. Arnold looked at developments of research in hardware, software, information management and media. 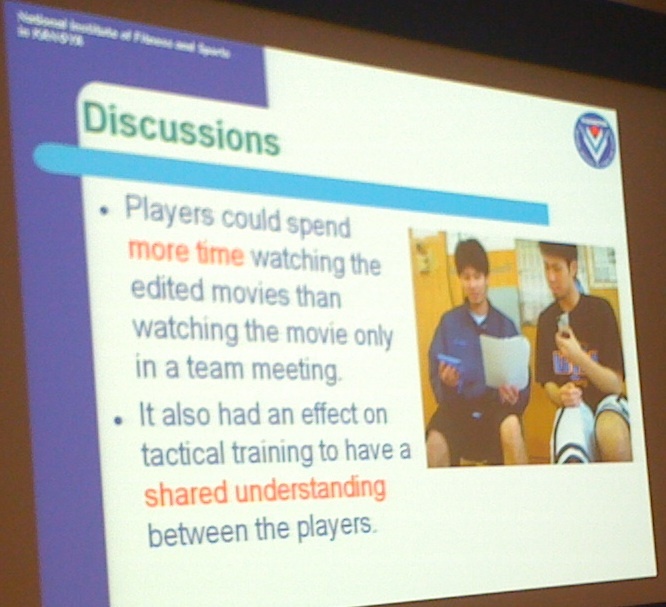 Arnold pointed out a number of cooperation links with other organisations: ISEA, ECSS, ICSSPE and IFIP. Daniel Link presented the second paper of the first session. He was introduced by Arnold Bacca. 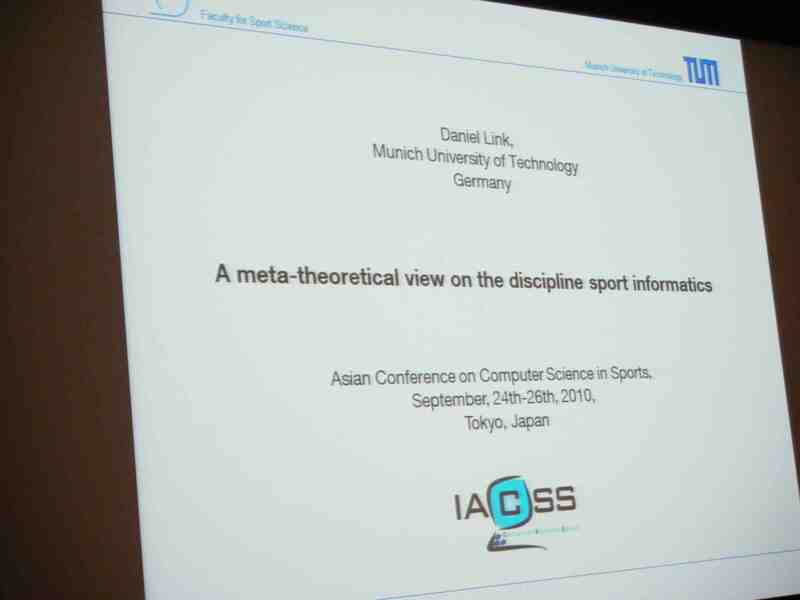 Daniel presented a meta-theoretical perspective view of the discipline of sport informatics. (Daniel’s paper here). 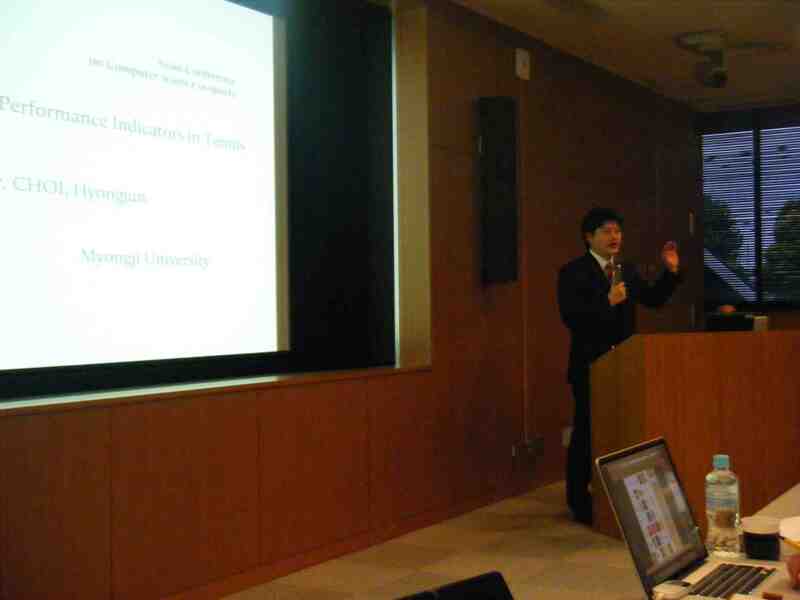 The fourth paper was presented by Tomohito Wada. 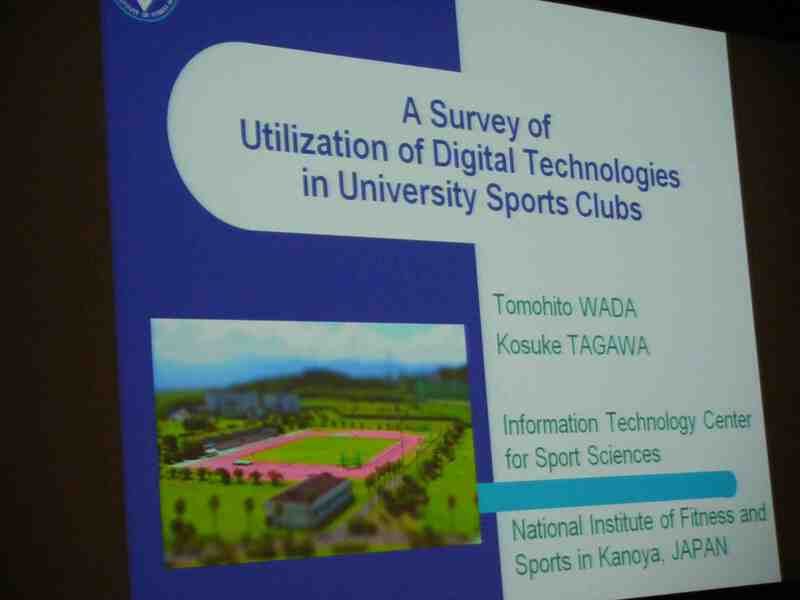 Tomohito’s paper reported his work at the National Institute of Fitness and Sports in exploring the use of digital technologies. 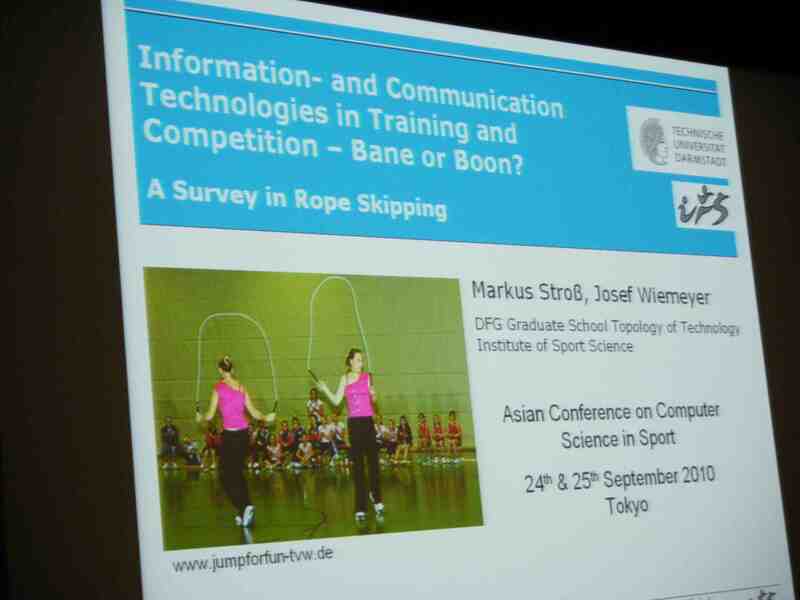 The concluding paper of the first session was presented by Markus Stross.